Although the recent blast of cold temperatures still makes it feel much like Winter here in the northeast, the Spring Equinox on the 20th of March marked the first official day of Spring in the northern hemisphere. Formed by two Latin words, “Equi” (the prefix for equal) and “Nox” (the Latin word for Night), on this day the sun shines directly on the earths equator, bringing virtually equal darkness and daylight to all corners of the earth. As human beings, it is our innate time too, along with plant and animal life, to catalyze new beginnings and shift our life rhythms. In the northeast, from this day forward and through until the Summer Solstice, darkness wanes and the days gradually grow longer. All life that was in hibernation over the winter months begins to slowly rise from its extended slumber. 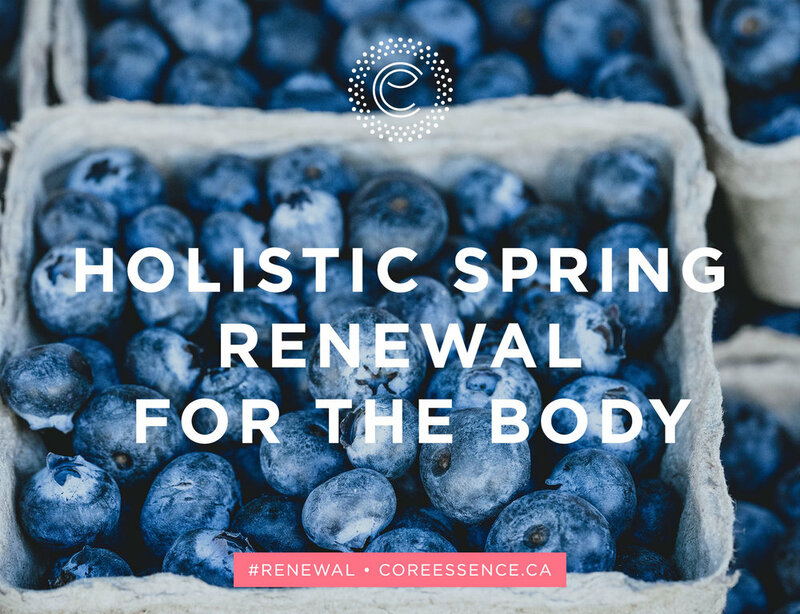 As we all transition into the Spring months, we offer you our holistic Spring Renewal Guide as a tool to help support you on your journey of renewal and rebirth! Eliminate the presence of technology in your bedroom. Create a true sanctuary and respite from the outside world. Commit to a “Digital Detox”. Set waking hours each day (not just sleeping hours!) where you digitally disconnect. For example, from 9pm – 8am, set your phone to “Do Not Disturb” and disconnect from the wireless network. Leave all email, messaging and browsing aside. Journal. Carve out even just a few minutes to reflect on your day. Acknowledge all of the moments and people you are grateful for. Scribble. Draw. Empty the contents of your brain. Meditate. If this is new for you, begin slowly. Find a quiet space where you can sit in silence for a few minutes. Deepen your breath, follow its rhythm, and let your thoughts pass by like the clouds. Exhale. Exhale deeply, fully, completely. Take some time to hear and feel your own body breathe. Exhaling is one of your body’s most efficient and effective ways of finding equilibrium. Each time you let go of your breath, you have the opportunity to release any lingering tension in the body and any worry in the mind. Increase your fluid intake. Begin and end each day with a glass of lemon water. Spice it up with the addition of ginger or peppermint. Shift away from heavier winter comfort foods such as root veggies and stews to fresh, crisp fruits and veggies. Eat seasonal and local whenever possible. Try a dietary cleanse. If suiting to your body type and life rhythms, eliminate wheat, dairy, sugar and alcohol for a committed period of time. Perhaps you begin with 3-days, and if agreeable continue for a total of 7-days. Notice how you feel and observe your true energy levels. Begin to harmonize your sleep patterns with that of your natural environment. As much as possible, shadow or mirror the natural daylight. Be mindful of your caffeine intake. With increase daylight and a cleaner diet, you will likely find that the body no longer craves the caffeine it once did. Commit to breaking a sweat every single day. This can be a brisk walk, a few flights of stairs, a 20-minute workout video, a dance around your living room, or a yoga practice. Sweating is self-regulation for the body, cleansing and purifying your vital organs. Practice a Detoxifying Yoga Sequence. Begin with core cultivation asanas to build heat in the center of the body. Continue then with asanas that bring compression to the core of the body such as “Happy Baby” and “Forward Fold”. Close the sequence with twisting varieties, always moving from the right to the left side, helping to wring out the kidneys and the liver. Enjoy “Sacred Sunday's”. Commit to doing only what you love on Sunday’s. Make this your day. Wander. Discover new places, people and things. Dedicate time to family and friends. Let go of the layers! Remove the flannel sheets and the heavy bed blankets from your bed. Replace them with lightweight fabrics bright and light in colour. Let the light shine in! Open the blinds, open the windows, open the doors. Allow the outdoors into your home. Remove clutter. Donate, gift, give away. Creating space in your home brings the gift of clarity to your mind. Pack away your winter clothes. Commit to keeping your favourite items only. If you haven’t worn a piece throughout the season, give it away. Get excited about a spring wardrobe. Use Pinterest to inspire new looks. Invest in just a few key pieces that will carry you through the season. Plant new life. Introduce simple, easy to care for potted plants and flowers into your home and outdoor space. Tending to these as the season passes will be therapeutic and representative of new life that can be cultivated. Tell us, what do you do for renewal each Spring?